Game Of Thrones Season 4 Finale Party: What Should You Wear to Watch Tyrion Meet His Fate? 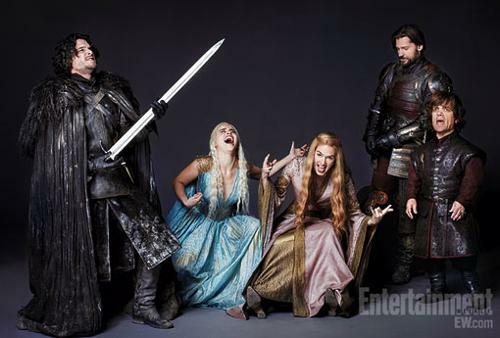 Say it ain't so... Game of Thrones fourth season is coming to an end! Tomorrow is the finale, so it’s time to start planning your festive outfit. You have a mere 24 hours. So take a trip to the craft store, dust off your sewing machine, and prepare to slap together yourself a light cosplay outfit. You’re gonna party like it’s the end of the long winter (even if we're still waiting for winter to get here) and you'll need the applicable regalia. It’s basically gonna be another Halloween, but the costume options are limited to Westerosi finery. Showing up in normal street clothes is not an option. Because in the game of dressing up as a pop culture reference, you win or you die. If you’re hard strapped for what exactly to wear, look no further than our handy GOT finale party style guide right here. This season, there were a plethora of looks to draw inspiration from. The wildling “eskimos in fatigues” style has its own charm. Dany’s style game kicked into high-gear with her conquering of Mereen. Margaery’s wedding dress gave us every bit of prom glamour that we’ve grown to expect from our “if you got it, flaunt it” incumbent queen. Even Sansa started taking a page out of the fashion plates of the Vale with her new “under-the-tutelage-of-Petyr-Baelish” look. If you're feeling extra adventurous, you can go for these "Iron Shoes." This is a chance to get creative with your closet. When all else fails, there are always “I’m with Hodor” t-shirts. Welcome to Mereen's Resort 2014 season presentation, AKA Dany's entire wardrobe this season. All you need to reprise the above look from the episode "First of His Name" is a choker and a bed sheet. This choker from Topshop is a great example of one that'll get you the look. Feed the bed sheet through the necklace, wrap the excess around your bod, cinch with a leather belt and voila! You're a Khaleesi. We're calling it, modified sarong. If you're feeling a bit more adventurous with your projects, take a stab at this funky number. You're the mother of cutouts. Lady Sansa is going through her Hot Topic stage, and we can't say we're not into it. A feather shrug, a black maxi dress, and a dark lucite pendant will get you this look without too much fuss. A craft store trip may be necessary, but the feather shrug is as good of a Saturday craft project as any. Check out the example below. This one is a bit more ambitious, but if there were any opportunity to repurpose your prom dress, this is it. That is, if your prom dress is in the same color family. Then all you need are a few tassels from the trim section of the fabric store, for the dress' train, and some super glue. A few hours of pasting together, and you'll be ready to watch your psychopath fiancé asphyxiate before your very eyes. Look, a pie! Your secret to looking like those North of the Wall guerrilla warriors? Pop over to the goodwill and grab yourself a shearling jacket. Slash it, stitch it back together with some twine. Then, splatter some bleach/water solution on the sucker. Treat it like a Pollock. With each splash, yell "YOU - KNOW - NOTHING - JON - SNOW!!"